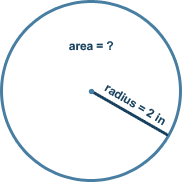 The following calculator finds the area based on the radius of a circle. The π value being used in rounded to 3.14. Type the value in the radius field and press the '»' button. Calculating area of a circle involves solving simple equation presented below. The only necessary measurement needed is the radius, which is a distance from the center of a circle to its edge. The π number is usually approximated to two decimal places and therefore equals 3.14. Area of a circle is equal to the surface of a plane that is limited by a circle. This includes the circle itself. In the matter of fact, geometry doesn’t give width to borders of any of the shapes on the plane. Therefore in that sense the border of a circle doesn’t have width and therefore it makes no sense to say whether the edge is included in the calculation or not. Calculating area of a circle requires one simple computation where the radius has to be known. The remaining part of the equation is dependent on so called π value. This can be calculated to the required precision, if extreme accuracy is required. However in the 99.9% of cases it is enough to take the approximation with several decimal places to get a result that will be close enough in most of the applications. Important thing to notice though is that exact calculation is not possible as it is impossible to find out the complete value of PI. The most precise calculation of the PI number have 2 000 000 000 000 000 digits. In every day life ability to calculate area of rectangular shapes is more frequently required. This perhaps is related to the fact that manufacturing process and transportation of most of the goods is easier if created with 90 degrees angles. If you are at least a little of a handyman you’ve probably already come across the challenge of calculating how much paint will be needed to paint the whole room or how many boxes of floor paneling is needed to cover the whole surface. All of those require simple multiplication of the dimensions of the area to achieve the required result. Circle calculations are performed less often in day to day life as significantly less circular objects can be found around us. However there are times when this calculation may be handy. Take for example quite popular inflatable pools for children. The area of a circle calculation will be well handy to tell how much water is needed to fill the whole thing. To get the result it is enough to multiply the surface of the bottom with the depth of the pool. If you happen to be a princess with a liking for DIY you could use the equation when in need to replace the floor paneling in your round tower. The subject is always covered at some point at the Math or Geometry classes. Understanding the calculation is crucial for further advancement into more complex areas. Another explanation of the concept of the area of a circle is that it matches the number of square units that can be fitted inside the circle. This idea is easy to picture on a sheet of graph paper. There it is easy to count how many full squares are within the borders and the remaining problem is to evaluate what is the area covered by the squares that are only partially inside. Actually this set up can be used for alternative approximate calculation. This way counting the full squares, plus using the equations for area of a triangle and a rectangular where appropriate could give us a result with sufficient precision. As examples usually are easier to understand than the abstract concept, let’s look at this simple exercise. Exercise 1: Calculate the area of a circle with a radius of 2 inch. Therefore, the result is 12.56 square inch. Obviously if the calculation is done in a length unit, the result will be in square of that unit. This comes from the fact that the equation does square calculation on the radius and radius is the number and the unit. In our example radius is 2 inch so (2 inch)² equals 4 inch². 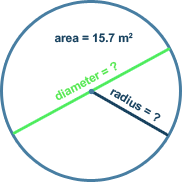 Exercise 2: The area of a circle is 35 m² (square meters). 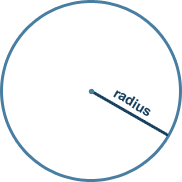 How long are the radius and the diameter of that circle. Reversing the same area of a circle equation we calculated that the radius of the circle in question is 2.24 m and the diameter being twice the length is 4.48 m. The result has been rounded as it is not possible to exactly calculate the square root of number 5.